I've gotta tell you my eyes nearly popped out of my head when I saw what this months challenge was. It was a freaky coincidence that I had just recently attempted macarons for the first time and my confidence was so boosted by that initial success that I had been planning to attempt them again the very weekend that this challenge came out. I had been saving this flavour idea for when I was more experienced, but I took this as a sign that I should just leap in head first and attempt my crazy idea. Now keep an open mind about this, it might sound extremely weird but trust me, it tastes so amazing. 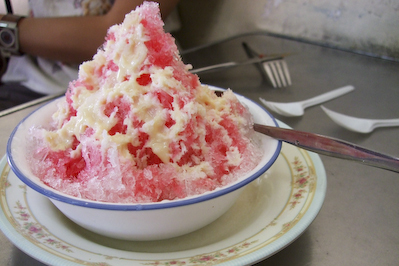 Ice kacang (or ais kacang) is a fabulous Malaysian dessert made of shaved ice, thick and bright pink rose syrup, creamed sweetcorn, evaporated milk and other extra sweet things such as grass jelly and palm seeds. It's wonderfully sweet and refreshing and the perfect dessert for the humid Malaysian weather. Many countries in South East Asian use sweet corn in desserts, ice kacang and sweetcorn ice cream being two of my favourites. But mention it to people who haven't grown up with it and they will usually raise their eyebrows in disbelief. I even remember one person saying, "I can't think of anything except chicken and corn soup when I think of sweet corn. 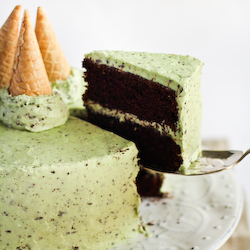 It doesn't belong in a dessert!". But seriously people, don't knock it until you've tried it. The sweetness of the corn really makes it the perfect flavour for a dessert. So here was my idea: A rose syrup flavoured biscuit with a sweet corn and evaporated milk buttercream, et voila - Ice Kacang Macarons! I realised afterwards that my first two Daring Bakers' challenges have been Malaysian-themed, but I had to do this flavour! It turned out to be a fairly traumatic and exhausting experience getting these right. First of all, I had serious issues with the recipe we were meant to use for this challenge. There just seemed to be too much egg white for the amount of dry ingredients, and the amount of sugar we had to beat into the egg whites seemed dangerously small. I attempted the recipe twice with the exact measurements given in the DB recipe and both times were EPIC failures. They were bubbly and cracked without the slightest hint of feet. Wasting 10 egg whites like that was pretty upsetting and I was ready to give up on the whole thing but I decided to give it one last go. I adjusted the ratios so there was more granulated sugar and more dry ingredients (and less egg whites in case it failed again!). And hurrah it worked! 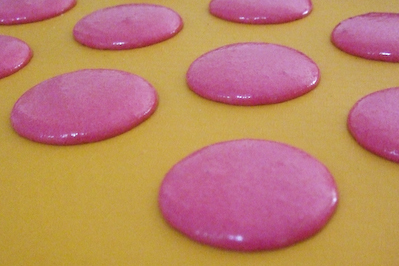 I was dancing madly around my kitchen doing what is now known as the 'feet dance', because right in front of my eyes were smooth pink macaron shells with FEET! I still did a couple more batches after that, tweaking it here and there to get the right colour and flavour. It was really difficult to get the rose syrup flavour into the macarons, unlike rose water it is a very subtle rose flavour and I didn't want to add too much of it to the meringue because it would upset the water balance. 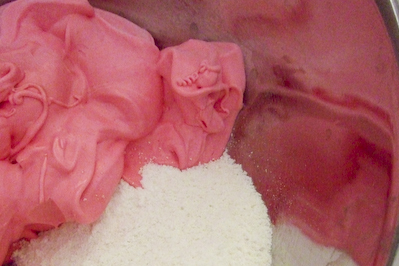 I ended up having to spread the rose syrup out on a tray and baked it in my cool oven to evaporate some of the water from the syrup before adding it to the meringue. But it was worth the effort, the biscuits had that distinctive sweet rose syrup flavour infused into it, without being overpowered by the flavour of the almond meal. Note: Rose Syrup is NOT the same as rose water. Rose water is clear and has a much more concentrated floral flavour, while rose syrup is like red cordial with a hint of rose flavour. 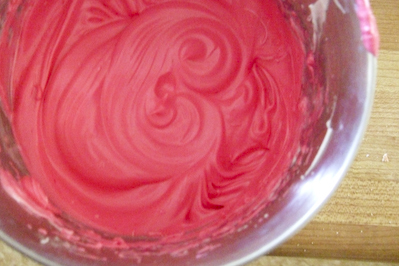 I also wanted that really vibrant pink colour that you see in the rose syrup, so I was lucky to get my hands on some pink powdered colouring. Though I may have added a tad too much, I freaked out a little when I saw how bright pink it went! But it seemed fitting in the end, and I really loved the final look of them. Then, disaster struck. 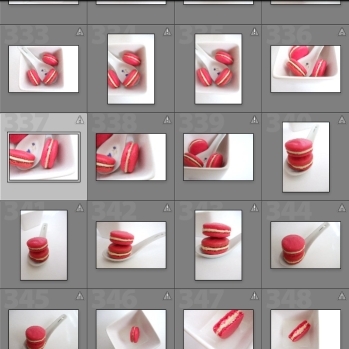 I had just dumped my final shots of my macarons off my camera onto my laptop, only to have the hard drive crash before I had a chance to upload them. After several painstaking hours attempting to recover those photos off my drive, I was left with corrupted jpg files that I could preview, but couldn't actually open. It was cruel and torturous, I could see them but I couldn't touch them! So I had no choice but to try making them again at the last minute. Unfortunately my last batch (third photo) were not quite as pretty as the ones from before (first photo), so I was feeling quite defeated. I think it will be a long time before I make this flavour again, as delicious as it is, after making 5 or so batches I'm totally sick of eating them! My boyfriend and workmates didn't mind though, A enjoyed the sweetcorn buttercream so much that he was eating it straight out of the mixing bowl. And all my workmates who hadn't tried sweetcorn in a dessert before totally loved them. You're also probably wondering how I was able to complete this challenge with my nut allergy. Lucky for me I realised not long ago that I could get away with eating a few macarons without having any reactions, it seems that my allergy to almond meal is very mild. Such a relief! Anyway, I'll give you the original recipe as it was meant for the DB challenge, but I'll also include any adjustments I made during my tweaking so what you chose to use is up to you. 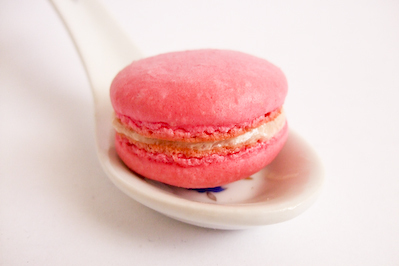 I found Syrup and Tang's macaron articles were total life savers when it came to figuring out what I was doing right and wrong with my macarons. 6. 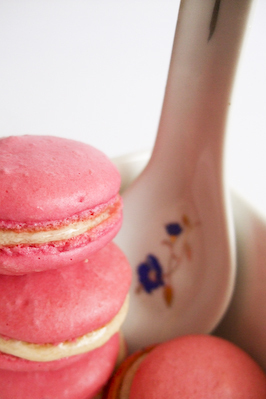 Bake the macaron for 5 minutes. Remove the pan from the oven and raise the temperature to 375°F (190°C). Once the oven is up to temperature, put the pans back in the oven and bake for an additional 7 to 8 minutes, or lightly colored. 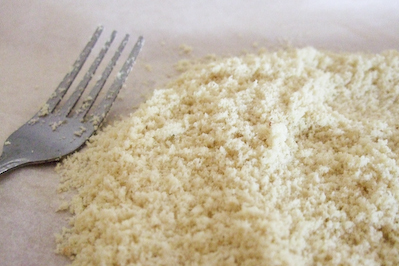 Combine the flour and sugar together in a medium saucepan. 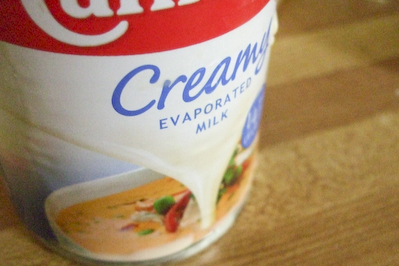 Gradually pour in evaporated milk, stirring as you go to remove any lumps (using a whisk will make this easy). Heat this milk mixture over medium low heat until it almost comes to the boil, stirring constantly. 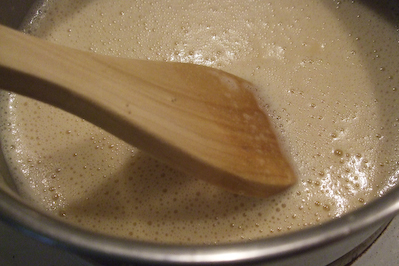 Reduce heat to low and continue to stir constantly for several minutes until mixture becomes thick and hard to stir. Allow to cool completely. 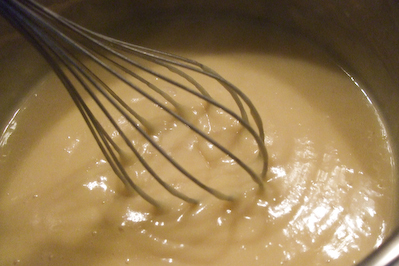 Beat softened butter in a large mixing bowl until it is pale and creamy. Slowly add the milk mixture and continue beating until smooth. Add sweet corn and icing sugar and beat until combined. Take care not to overbeat at this point or the mixture can split. If mixture is still very runny you can add more icing sugar. 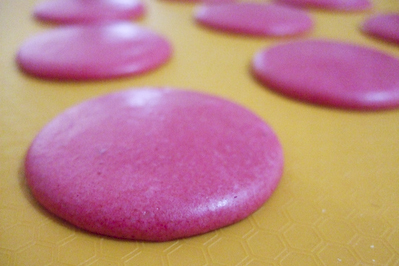 Allow to cool in the fridge and then spoon mixture onto macaron shells. I had some serious issues with my last batch of buttercream which I made. The mixture split and was super runny, so the photos I took at the last minute to try and make up for all the great photos I lost were kind of terrible. I really didn't have the energy to try again, so the photos in this post are the best that I could scrounge up from the scraps of photos I managed to recover. Batch #2: So freakin happy with these. 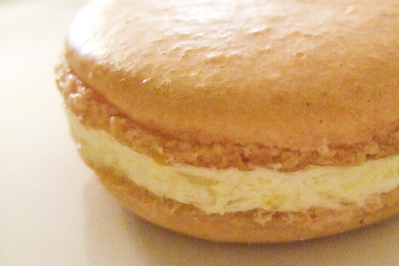 In the end, I feel so much more confident about baking macarons. Thank you so much to Ami for choosing it for this month, it really was a great challenge. It pushed me as a baker and I will definitely be experimenting with more flavours and techniques in the future. Plus they were so yummy that I couldn't stop eating them! I am officially obsessed. Wow, those are absolutely stunning! Well done! Mine were disastrous. Oh Steph! I felt so bad for you when you lost all your pics - all I could think of was "OH NO she has to make more macs!" especially seeing as your first batch that you put on the forum looked so pretty! Fantasic flavours. The colour is so tempting! Sorry to hear about your computer. Can you believe the same thing happened to me last week. So frustrating. The entire computer was corrupted though. Despite that, your macarons are great. Your macarons are just perfect! Good on you for perservering after the first 2 batches weren't what they should be - the other 3 made up for it. Oh Steph, they look great! 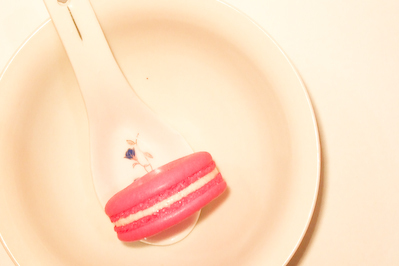 You must certainly be the Macaron master by now. I also had epic failures with this recipe... I had wasted so many egg whites, that I just couldn't try again (I was out of time too). 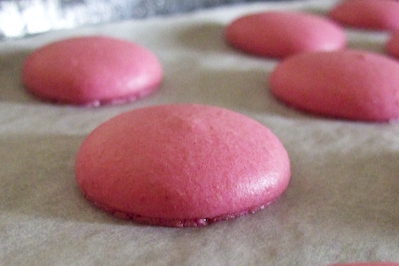 You've done a great job in tweaking the recipe - your macarons have turned out beautifully - nice job! Oh the thumbnails! How heartbreaking! These are one of the best home made macarons I have ever seen!!! Good on you!! Oh wow! For the life of me I would not have thought of ice-kacang. This is great! Absolutely gorgeous color, and what incredible perseverance -- I would've been devastated to lose all those beautiful pictures! I'm so glad you were determined. I'd love to try the sweetcorn flavor! Interesting! your macarons look awesome. I love the colour! Hi Steph - I knew it! You pulled it off! Great job. I love the way you used the cream corn filling - I will definitely add to my little bag of tricks! It is such a unique flavour. 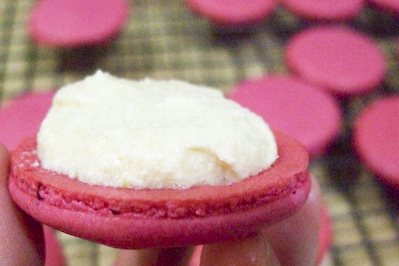 What a great idea putting ice kacang flavour into a macaron! They look fantastic - I love how pink they are! they are so pretty, I adore your pictures. Truly nothing wrong with sweetcorn in a dessert! 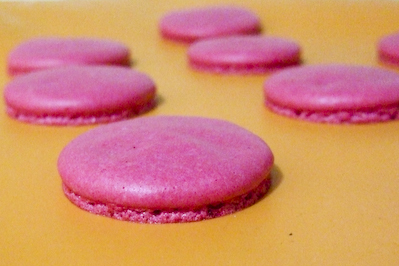 The macarons look so pretty in pink! Wow, those look wonderful! I would love to try one! For some reason I never got around to trying ice kacang when I was in Malaysia last year, but I've had sweet corn ice cream and that was delicious, so I can totally imagine how great your macarons would have tasted! We also had serious issues with the challenge recipe and ended up returning to our old trusted one. Amazing job Steph! This is one of the msot creative flavours I've seen! :D And sorry to hear about all the trouble you had! Those are so perfect! and the pink color is precious: would be great for breast cancer fundraising. WOW what a colour and Ice Kacang Macarons what a flavour and I love how you tweaked the recipe to get the results you did, wonderful talent. Bravo Bravo Bravo. Cheers from Audax in Australia. I wanted to do a rosewater buttercream filling but got carried away with other flavours and never got around to it, but I must say, your flavour combo sounds really good. Letting you know I thought I'd give you a Shout-Out for having the most perfect looking macarons I've seen so far out of all my blog exploring this month! Good job!! So gorgeous. Love the colour & flavour & everything!! Sooo beautiful and they sound yummy. What is up with the challenge recipe? Did it work for anyone?? The color on yours is just beautiful. Mine were brown:) Definitely want to try this sweet corn for dessert! Sounds intriguing. Food.Baby - Oh thank you!! Gosh I saw what happened to yours, I totally feel your pain! The first two failures were very upsetting for me. Lisa - heehee thanks hun!! damn technology! Ellie - I know, it's so weird that both our computers died within the space of a week! Thanks!! billy - Haha thank you :D LOL it totally does rock doesn't it! I'm lucky I had it installed on multiple comps! lili - Hahaha I wouldn't go that far!! I think I'll leave it up to the experts but it was definitely a fun learning experience. Thanks! Anita - Oh you poor thing! I know it's so terrible thinking about how many egg whites get wasted when it doesn't work out :( I nearly gave up after the first two but I wasn't ready to accept defeat! shaz - OMG TEH HALIA MACS! SO AWESOME! Karen - I know!! So close but so far :( Yeah at first I thought it was ridiculous but when I reduced the colour for my last batch I found the colour a little boring! Brenda - Oh wow! Thanks :) Though I've definitely seen better out there! Jo - Hahaha yeah it's just one of the crazy ideas that I come up with in my random brain :) Thanks! Julie - Thank you! I'm a bit obsessed with the colour now, no matter how unnatural it is! You should try it sometime it's great! Kat - Thank you so much! Trissa - Aw thanks Trissa!! I was hoping I would get some macs that were even slightly close in resemblance to the beautiful ones you make! Jacq - Heehee thank you so much! Wic - Oh thank you!! I wasn't so sure about them since they were the scrap photos that I had left! Y - I totally agree, more sweetcorn in desserts I say! Thank you!! Jenny - Oh that's great you tried the sweetcorn icecream, it's my absolute favourite! I make my mum buy a box for me before I come to visit! Thanks, glad to know I wasn't the only one! FFichiban - hahaha exactly! My workmates were like "OHHH what a shame, you'll just have to make more and feed them to us". Olga - Hehe that's exactly what I was thinking too! It is pink ribbon month after all. Audax - Thank you so much! It was especially possibly because of all the amazing advice you were giving out on the forum. 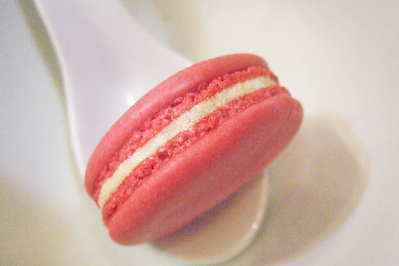 You're the macaron expert! What a killer post, and some excellent photos too, even if you lost some of your better ones. Just the thought of data corruption brings me to a teary state as I've felt your pain in the past (major uni assignment in my case). I've never had that dessert but seriously, sweet corn can go in desserts just fine - it has the word sweet right in its name! Your macarons are absolutely beautiful and I would love to taste them. 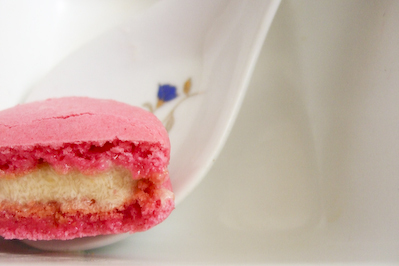 This is the most beautiful recipe for rose macarons I have seen yet. I am going to use this for a blogger benefit bake sale this December in Los Angeles. Ty Ty Ty!!!! 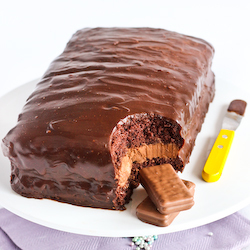 I've told you many times and I'll say it again; you're an awesome baker (i reckon with training, the ability to surpass the zumbo) - and the best non-slr owning blogger there is; despite all the setbacks ;) keep up the good work and the awesome recipes! After all the trauma you went through with your hard drive crashing and all, it shows real strength of character to get back in the kitchen and whip up even more spectacular macarons. Excellent! 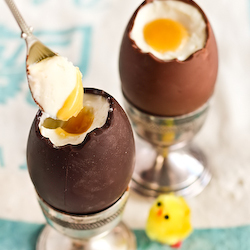 your patience and resilience to recreate these for the sake of reader photos is highly commendable too! Yum! These look delicious. I love Ice Kacang. What a great idea. Great job on your macarons. They llok so pretty in pink! My heart sank the second i read your tragedy!! I would have burst out into tears! But despite the disaster the photos you do have are totally fantastic! They look awesome. I'm totally intrigued by the cooking method. I dont think I'll give macarons another go, they seem too much trouble to me. A very pretty mac! !Well done! Linda - Oh thank you! I'm still trying to get bigger feet like yours! Simon - :D Thanks!! Oh trust me I was curled up in a corner rocking back and forth when I first realised I had lost my photos :( Uni assignment sounds even worse! Damn, I would totally have traded you! Next time? Food, she thought. - oh wow thanks! Good luck, I hope they turn out. By the way make sure you don't use rose water, it's gotta be rose syrup! Belle - thank you, I just couldn't bear the thought of having to skip the challenge and not show everyone this idea! Helen (Grab Your Fork) - hurrah! Good to know there's another convert out there :) Thank you! Maria - Aww! I very nearly did, it was so upsetting! :( They are a lot of effort aren't they? Namratha - thanks so much! 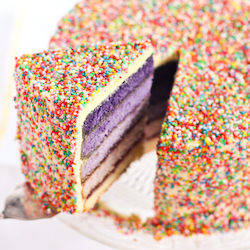 i am a closet baker from Perth, WA and happened upon your blog and its been a big inspiration! i just tried to make macs for the first time the other day and reading all your mac recipes and picking up the wee tips you gave each time helped heaps! thank you so much and thanks for being a great baking inspiration! i looooooove baking!